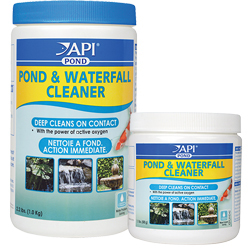 Pond & Waterfall Cleaner uses the power of active oxygen to deep-clean pond surfaces, waterfalls, fountains, and bird baths on contact. It is safe for all fish and aquatic plants, and should be used as needed to maintain a clean, clear pond or outdoor water feature. Directions for use: For waterfalls and fountains: turn off water pump. Powder must come in contact with wet debris to be effective. Wait 15 minutes before turning pump on again. Repeat as needed. For birdbaths: sprinkle directly into the birdbath water. Wait 15 minutes, then rinse and refill the birdbath.